The 20th annual Dog Walk and Woofstock fundraiser for the SPCA of Wake County is Saturday, April 27, at Koka Booth Amphitheatre in Cary. Above, participants from the 2015 event, which was held in downtown Raleigh. The 20th annual SPCA Dog Walk and Woofstock will be Saturday, April 27, from 9 a.m. to 1 p.m., at Cary’s Koka Booth Amphitheatre. Participants can enjoy vendor booths, food trucks, music and more. There will be a rally at the stage emceed by Two Men and a Mom of Mix 101.5, this year’s presenting media sponsor. Then pets and their people will walk around Symphony Lake at 11 a.m.
Each year, nearly 2,500 people and 1,000 dogs attend the event. 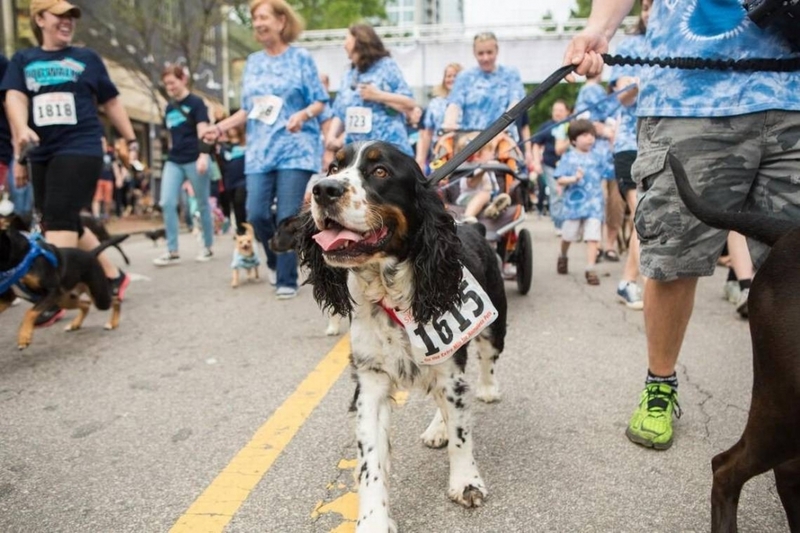 The goal of the Dog Walk is to raise $245,000 to provide medical care, spay/neuter services, shelter, food and love to the more than 3,600 animals the SPCA of Wake County rescues or re-homes each year. It takes $120 to save the life of an animal at the SPCA of Wake County. These are animals that do not require extra medical or behavioral care, healthy animals who are dying every day in area shelters. These animals can be saved when people register for the walk and ask their friends and family to make a donation toward their efforts. “If 2,000 people registered for the walk and each raised $120 or more, the SPCA of Wake County could reach its goal of saving 2,041 homeless pets through this year’s event,” said Tara Lynn, media manager for the SPCA. “That means we can give a second chance to animals who simply didn’t have the time or space available in a municipal shelter, in addition to the animals we care for regularly that do need extensive care,” she added. People can join by registering for the walk online at SPCAwake.org/walk. Registration is $35 for adults and $20 for youth ages 14 to 8. Kids 7 years old and younger are free (but can register as a youth participant if they would like an event t-shirt). The SPCA of Wake County is a local, independent, nonprofit organization that receives no government funding or tax dollars. It relies almost entirely on private donations to fund its annual operating budget of $3 million. The SPCA of Wake County is not affiliated with the ASPCA (American Society for the Prevention of Cruelty to Animals).